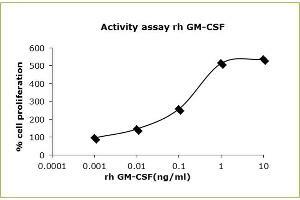 Analysis of recombinant GM-CSF with specific anti-human GM-CSF by Western Blot. MWM: Molecular weight marker (kDa), lane 1 contains 500 ng of rhuman GM-CSF. All bands shown in lane 1 have been identify by MALDI-TOFF as recombinant GM-CSF. SDS-PAGE analysis of recombinant GM-CSF. 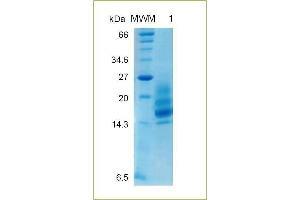 Samples were loaded in 15 % SDS-polyacrylamide gel and stained with Coomassie blue. 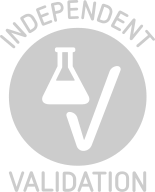 MWM Molecular weight marker (kDa), lane 1, contains 500 ng of rhuman GM-CSF. All bands shown in lane 1 have been identify by MALDI-TOFF as recombinant GM-CSF. The activity of recombinant human GM-CSF is determined by the dose-dependent induction of human TF-1 proliferation cell. Cell proliferation was measured by MTT method. ED50 is ≤ 0. 05 ng/mL. 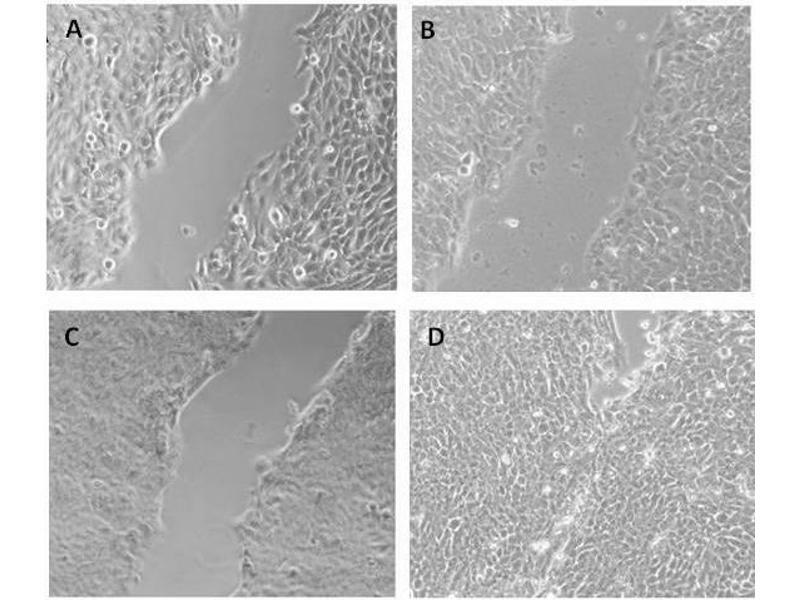 Effect of rH GM-CSF on kerotinocytes migration (HaCaT cells). 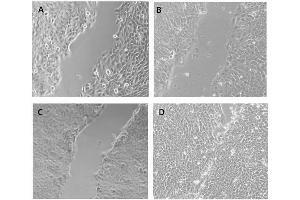 24 hours effect on skin cell migration, scale bar 100 px, A: Untreated cells, B: Positive control GF cocktail 10 %, C: 0.5 ng/mL rH GM-CSF, D: 1 ng/mL rH GM-CSF. Specificity Serological Identification: The protein was electrophoresed under reducing condition on a 15 % SDS-polyacrylamide gel, transferred by electroblotting to a NC membrane and visualized by immune-detection with specific GM-CSF antibody. GMCSF is a cytokine that stimulates the growth and differentiation of hematopoietic precursor cells from various lineages, including granulocytes, macrophages, eosinophils and erythrocytes. It´s involved in differentiation of dendritic cells and is a key factor in differentiation pathways leading form stem cells. GMCSF is produced by several cell types as monocytes, fibroblasts, endothelial cells and T- Lymphocytes in response to a number of inflammatory mediators present in the hemopoietic environment and peripheral site of inflammation. Human GMCF is an important therapeutic cytokine used in the treatment of myeloid leukemia, neutropenia and aplastic anemia and it could become interesting in the treatment following bone marrow transplantation. It performs its biological activity by binding to a specific receptor complex which is composed of a cytokine-specific alpha chain and beta chain, shared with the receptors for interleukin-3 and interleukin-5. GMCSR has been identified to mediate the activation of Jak-Stat and MAPK pathways. rHuman GM-CSF is a glycosylated polypeptide chain containing 127 amino acids (18-144 aa CSF2_HUMAN P04141 ), fused to 10 His tag at N-terminal. 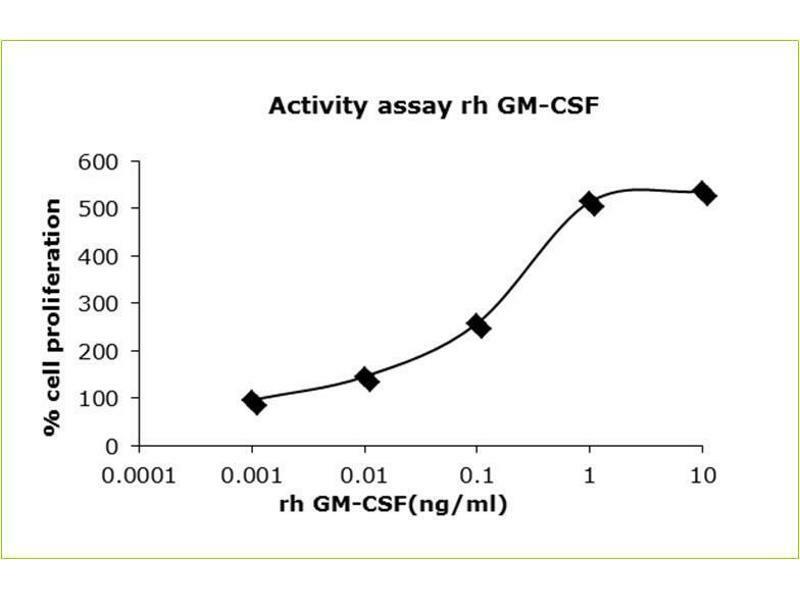 rHuman GM-CSF migrate as a broad band between 15 and 25 kDa due to post-translation modification, in particular glycosylation. Human recombinant protein expressed in Nicotiana benthamiana. Recombinant human Granulocyte-macrophage colony-stimulating factor (GM-CSF) contains a 10-His-tag at the N-terminal end, is produced by transient expression in non-transgenic plants and is purified by sequential chromatography (FPLC). This product contains no animal-derived components or impurities. Animal free product. 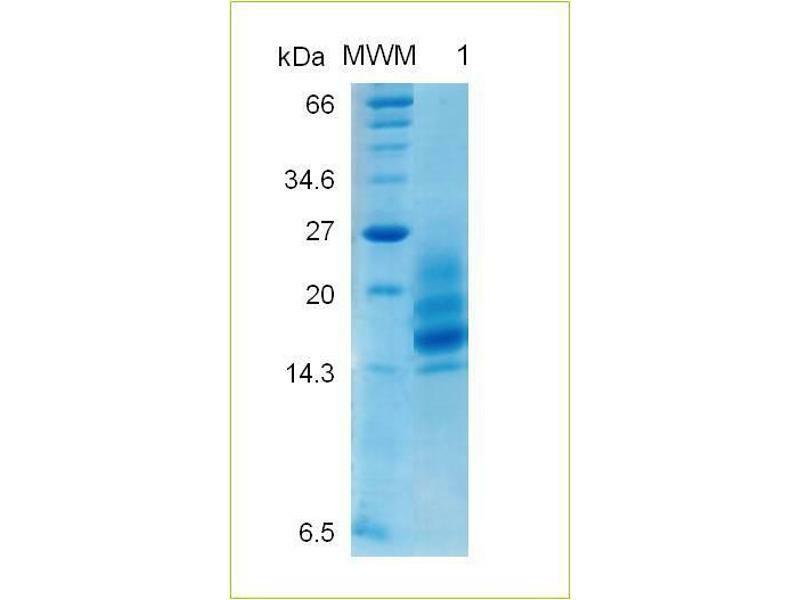 The protein was resolved by SDS polyacrylamide gel electrophoresis and the gel was stained with coomassie blue. Reconstitution Lyophilized protein should be reconstituted in water to a concentration of 25-50 ng /µL. Optimal concentration should be determined for specific application and cell lines.